The average gaming computer uses as much power as three refrigerators. It’s no secret that the growing numbers of computers around the world use a significant amount of energy, even as the efficiency of individual devices improves. But one particular type of computer use wins the dubious distinction of energy hog among personal computers: devices used for gaming. Gaming is the most energy-intensive use of personal computing, and high-performance “racecar” systems built specifically for gaming consume an incredible amount of energy, according to a new study co-authored by a researcher from Lawrence Berkeley National Laboratory. Gaming PCs make up less than 3 percent of installed PC equipment worldwide, but they account for 75 terawatt-hours per year of electricity, at a cost of about $10 billion. Each gaming computer uses the equivalent of about three Energy Star refrigerators. That adds up to nearly 20 percent of total PC, notebook and console energy use. There are already more than a billion people gaming around the world, and if growth continues, that energy figure could double by 2020. 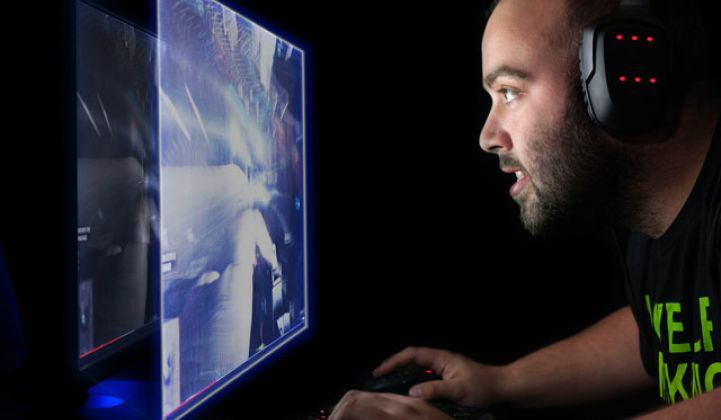 About 72 million of those gamers are estimated to use gaming computers in 2015. The average gamer spends more than four hours a day playing games on a computer. But there is significant room for savings, the study found. More than 75 percent of the energy could be saved if more efficient components are used in manufacturing, but few gamers are clamoring for more efficient devices. “A consumer decision-making environment largely devoid of energy information and incentives suggests a need for targeted energy-efficiency programs and policies in capturing these benefits,” the paper states. Before this study, there had been no attempt to find the aggregate energy used by serious gamers. The authors note the limitation of using nameplate estimates of power requirements, especially because nameplate power values are often far higher than total power use. 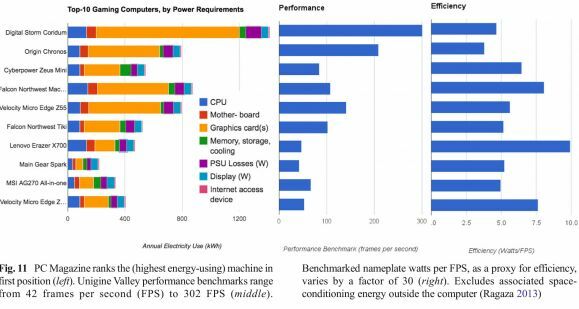 The authors assessed the energy draw of various components and estimated the nameplate capacity for the top 10 gaming computers as defined by PC Magazine. To gather more accurate figures beyond relying on nameplate data, the researchers built their own baseline gaming computer using off-the-shelf components. They found that energy use during active gaming was six times that of a typical desktop computer and double the energy use in idle mode. Energy use could be improved without a loss of computing performance, the study concluded. 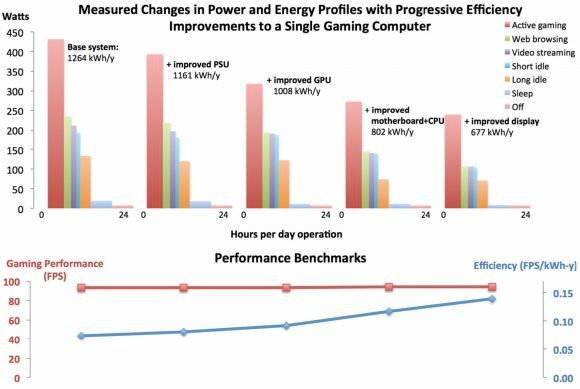 For example, more efficient graphics processor units lowered peak demand by 19 percent. By putting in more efficient motherboards, displays, central processors and power supply units, total energy use was cut by nearly half. Changing operational settings to the motherboard and CPU achieved another 27 percent in energy savings. The aggregate energy savings of about 75 percent would translate into $18 billion per year in 2020. Despite the opportunity for savings, however, the gaming community as a whole seems to lack awareness about the power draw of their devices, as do the salespeople selling them, the study found. There is a voluntary standard, 80Plus, that estimates total cost of ownership, which includes energy, but this information is sometimes misused or cited incorrectly in stores. The study authors acknowledge that the findings are preliminary, but only because more market data is required and standardized methodologies for measuring this type of energy use currently do not exist.